“Is it because I haven’t been outdoors for so long that I’ve become so mad about nature? I remember a time when a magnificent blue sky, chirping birds, moonlight, budding blooms wouldn’t have captivated me. Things have changed since I came here.” This comes from “Anne Frank, The Diary of a Young Girl,” a reaction she shares two years after going into hiding indoors during the Nazi occupation of Holland. I came across the Frank quote, because I’ve been on a diary-reading binge lately, a recommendation by my writing coach for the historical novel I’m now working on. But other reminders about the value of spending time outdoors have popped up recently. An article in the current issue of the University of Washington alumni magazine asks “Should a dose of nature be the doctor’s orders?” The title of the piece, “Go outside and play,” answers the question. And at a writers’ conference I attended a week ago, an author who writes about the environment talked about writing outdoors, even if it means wearing fingerless gloves and a coat. For seniors, we find “7 benefits of being outdoors” in a newsletter blog from a retirement community in Massachusetts. The pluses include “lifting spirits, improving sleep, strengthening immune systems, keeping Vitamin D levels up, and giving our energy a jolt.” This same newsletter blog says sewing reduces stress, which would make its report on the outdoors questionable if it weren’t for all the other reports that align with it. It’s the time of year in the Pacific Northwest when getting outside without getting soaked is possible. 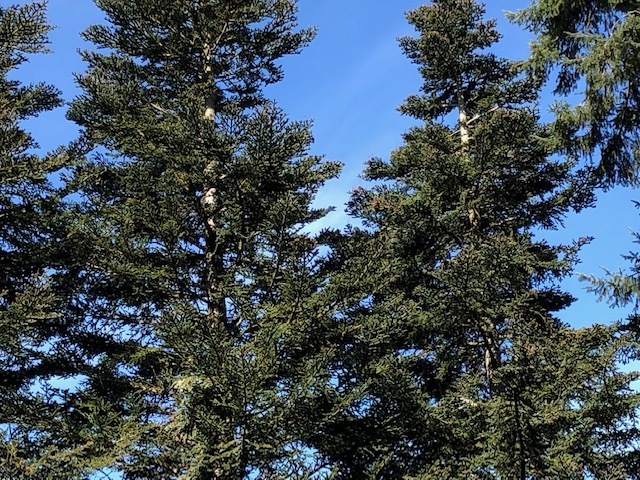 Last week on a perfect sunny morning, a friend and I walked through the University of Washington Arboretum, a forest within a city, a delightful experience that confirmed I need to get out more. Of course, I could always step into my back yard where dandelions and other weeds are calling me. I don’t mind pulling weeds, but the idea of a forest bath that involves no effort is very appealing. 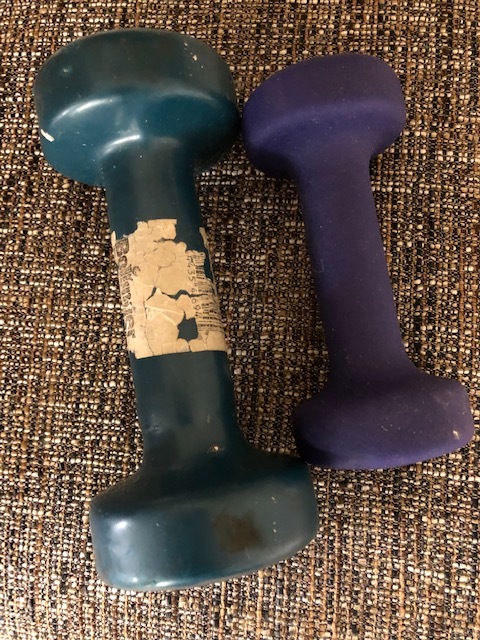 For the past few months I’ve taken a wonderful exercise program for, ahem, “older adults.” Actually I’m one of the youngest in the class, which boasts at least two women over ninety. When I’m 90, my goals is to lift heavier weights with the ease these two now lift them. Actually, that’s my goal for my current age, twenty years younger. The class also involves exercises with bands and balls and spends time on balance, stretching and aerobics. Most difficult is sucking in our bellies while moving other parts. Each exercise has a specific purpose, whether it’s to prevent falls, improve posture, or enable us to do everyday activities independently as we age. Exercise is an on-again off-again part of my life. Like many women my age, sports and formal exercise programs didn’t play a significant role in growing up. My grade school exercise experience consisted of walking to where I needed to go. My priority was to use my free time to read Nancy Drew books, not run and jump around. The only school sport I was proficient in was tetherball, which is officially a game, not a sport. At my childhood Y, I learned how to twirl a baton and jump on a trampoline. After the latter caused a back injury my mom dragged me to a chiropractor. This cycle of exercise- injury, exercise-injury set the tone for other fitness experiences as I grew older. As a freshman in college I passed the swim test (even dog paddling counted as long as you could cover the distance required) thus escaping PE for life. Much, much later, my husband and I got involved with then-popular weekend volksmarches: 10km, non-competitive, family walks to charming places, such as farmlands, decaying towns about to disappear from the map, and a women’s prison overlook. Those who completed the walks earned a different lapel pin for each one and for a time my husband and I were proud collectors of these “medals.” Years later, jogging became popular, and I jogged mostly around school tracks. Instead of medals I earned shin splints. We did do cross-country skiing for several years, which was great exercise, but only when it snowed in the mountains. And we burned no calories for several hours getting there and back. We joined the local Y and for a time I became a fan of weight machines, treadmills and elliptical machines. At 60, I signed up for a course filled with forty- and thirty-somethings. I gained strength and stamina and loved the class, but had to quit after being thrown off a horse (not related to the class). Eventually I returned to the Y’s machines, but found them boring. A woman I met in the challenging class suggested I try “chair fitness” to gain upper body strength. Harrumph. Chair exercises? “Do I look frail and feeble to you?” I wanted to ask this question, but instead tried the class and loved it. Then I broke my ankle (again, not in class). I’m now back at it. In case I’m tempted to quit, I only have to remember something I just read: “The frailty and decreased energy we associate with aging, such as difficulty walking for distances, climbing stairs, or carrying groceries, are largely due to muscle loss.” (Tufts University) Also, strength-building helps keep up bone density, lessen arthritis pain, and increase metabolism for long-term weight control. I have proof of progress. I can rise from a squishy couch holding squishy Gordon, my fifteen-pound cat, and stand straight up — no hands involved, just my strong thighs. Regrettably, now I have to find an exercise program for Gordon. 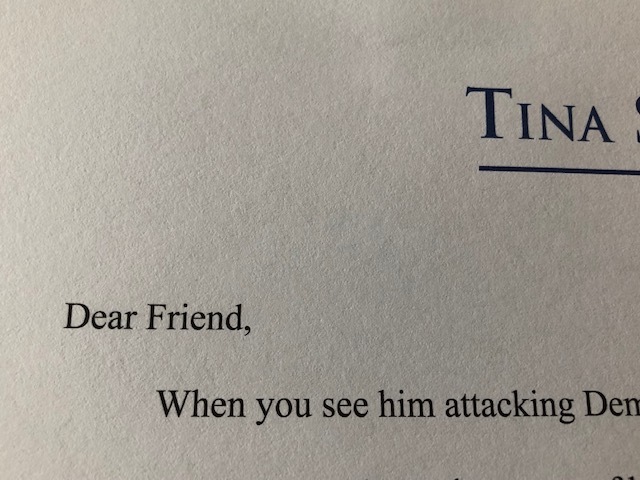 I receive emails almost daily from others who would become my friend if only I would give to their campaigns in “fill-in-the-blank” state. My old friends (meaning those still living and living nearby) rarely telephone; they text. but my new friends can’t stop calling me. In fact, no matter what state or country they are calling from, the first three digits of their phone numbers match the first three digits of mine. Some coincidence. I’m only disappointed that they never leave messages. Some new friends are — dare I say it? — robots. One calls weekly to tell me that the Microsoft product I purchased (they must forget I have a Mac) is defective and I must call them right away to get it fixed, no doubt by giving them my credit card number and bank balance. I want to suggest a voice box transplant to two of them, but I know all of us can be sensitive about criticism of our voices (my husband says mine is too loud and I say he mumbles) and I suppose I don’t know these callers well enough to recommend surgery. Members of a newer group of friends seem overly concerned about whether they’re making a good impression on me. These include post office personnel, my family doctor, my chiropractor, bank tellers, the garage where I get my car serviced, and the shop where I get documents copied. It turns out that everyone hopes the time I spend with them is a memorable, life-transforming experience. I’m glad I’m retired, because keeping in touch with all these new friends and responding to their concerns is becoming a full-time job. “You’re going to have a lot of fun here,” said the woman, giggling as we entered and she exited the supermarket this morning. We grabbed the last cart and wheeled it toward the produce section. But wait. Where did the bananas go? The broccoli? The apples? 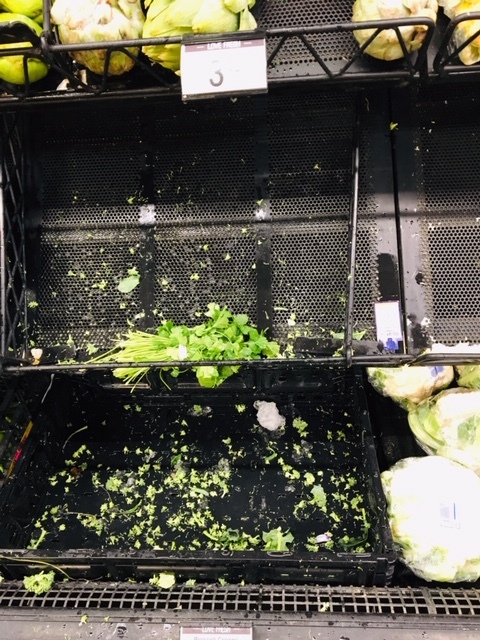 The lettuce? 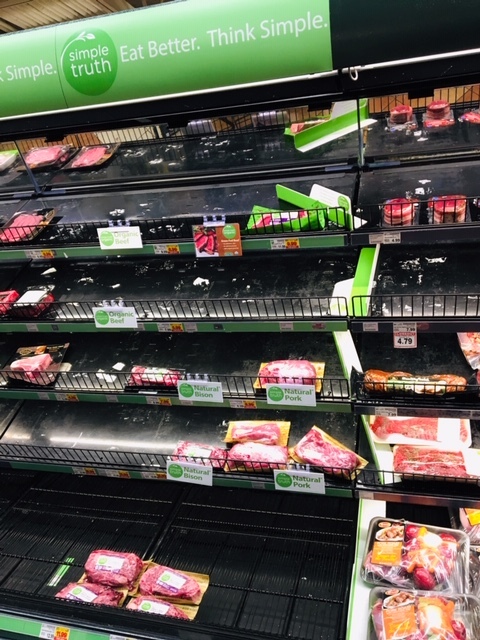 I’ve lived in the Pacific Northwest all my life and until today have never seen anything like today’s empty grocery shelves. It’s the weather’s fault. But back to the weather. We’ve no hurricanes, no blistering heat waves, no blizzards, it’s rarely too hot, or too cold. But this week we have snow, not a big event in many parts of the country but a very big deal here. The snow started Sunday, went through Monday, and started up again today. Cities in our part of the country do not invest heavily in snow removal equipment, which means that streets are often impassable and people are stuck in their homes. 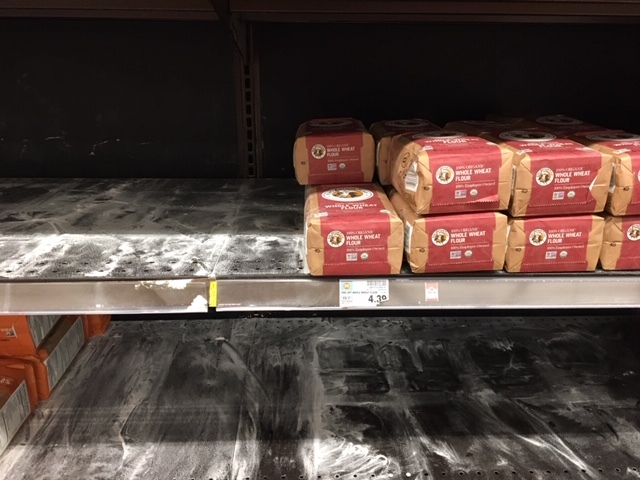 This explains why so many people have hung out at the supermarket the past two days and creating a setting that matches the kitchen of Old Mother Hubbard. 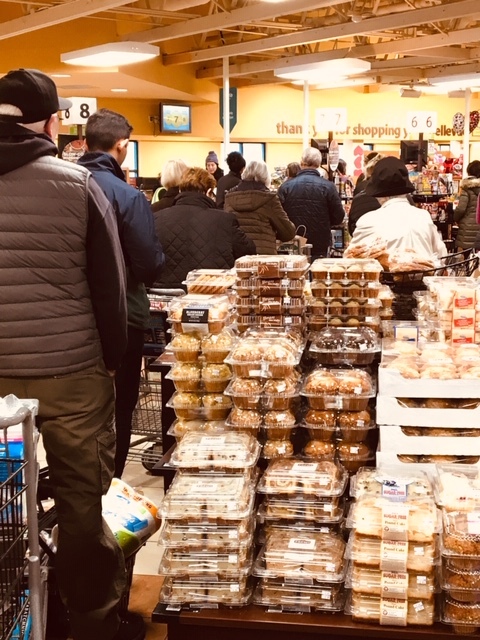 After standing in the longest checkout line in my personal history of grocery shopping — there was a similar line for each all eight cash registers and self-checkout — we asked the checker how she was holding up. “When I went home last night I was exhausted, but I told myself it would be a lot less busy today,” she said as she collapsed over her register. Looking outside, I’d say the rush to shop is over. Now the checker will have to face miles of backup on the roads as everyone leaves work early to avoid traffic. What’s in a souvenir? Nothing as sweet as a rose, but it is a reminder of a person, place or event important to the collector. Souvenir is the title of an entertaining, hundred-page book by Rolf Potts. I admit it. I can’t travel without purchasing at least a small souvenir, something reminiscent of the country I’m visiting. I had never thought of souvenir collecting as worthy of its own written history but Potts’ book changed my mind. Potts begins his story by describing a gift shop in Paris where tourists can take home all things Eiffel: “Eiffel Tower t-shirts and Eiffel Tower snow-globes; Eiffel Tower whiskey flasks and Eiffel Tower oven mitts…” I’ll spare you the rest of the list of Eiffel towers that goes on for two long paragraphs. Over the centuries, not all souvenirs, such as contraband, were as innocent as Eiffel towers, and some — human scalps and ears — were downright horrific . Sometimes the experience of acquiring the souvenir is as rewarding as the object. 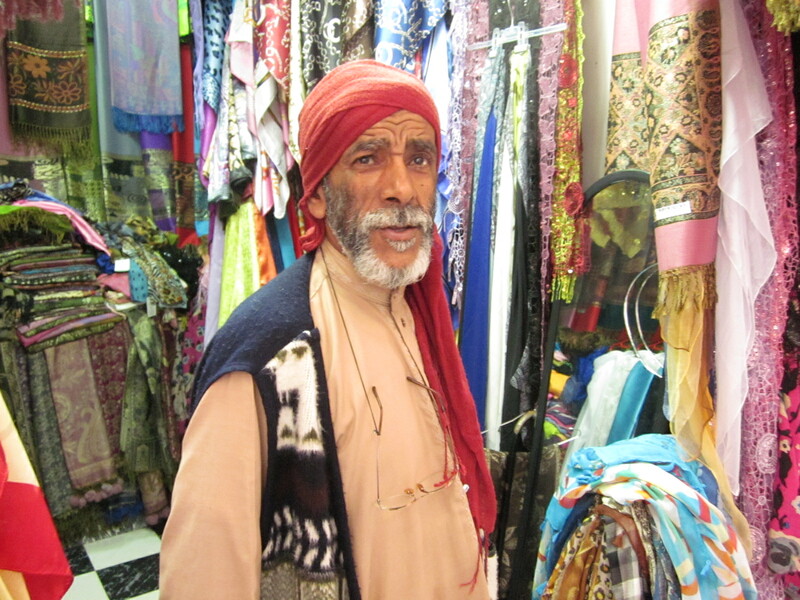 As when I bought scarves from the multilingual Alibaba in the Casbah of Tangier who offered a special price of five euros each or three for twenty. Or when my husband and I visited the Santa Clara Pueblo in New Mexico hoping to see examples of the black pottery for which it is famous. We drove around and around residential neighborhoods empty of shops and other businesses, eventually saw a small sign indicating “pottery for sale,” and parked. Victory was ours. Minutes later, we walked into the kitchen of a private home just as the family gathered around the dinner table. Oops. Wrong door. The family was gracious in pointing out where we should have gone and now we have a small pot to remind us of our persistence and our red faces. 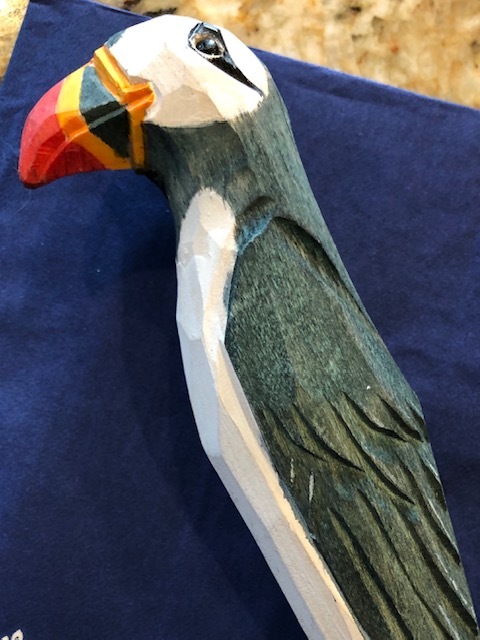 Souvenirs don’t always turn out as expected and those too can provide memories. 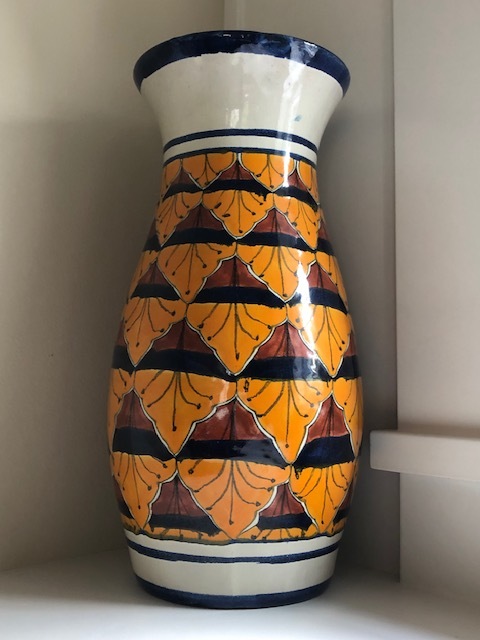 I once bought a gorgeous vase in Tlaquepaque, Mexico, got it home safely despite the hours it spent in the nose of a small plane. and christened it with fresh-cut sunflowers. As the day passed the water seeped through the porous pottery and ruined the table my new vase sat on. We still have both the table and the vase, the latter in better condition than the former. Though I mostly collect quality mementos when I travel, I admit to taking occasional pride in the tacky. The puffin pen will always bring Iceland to mind. 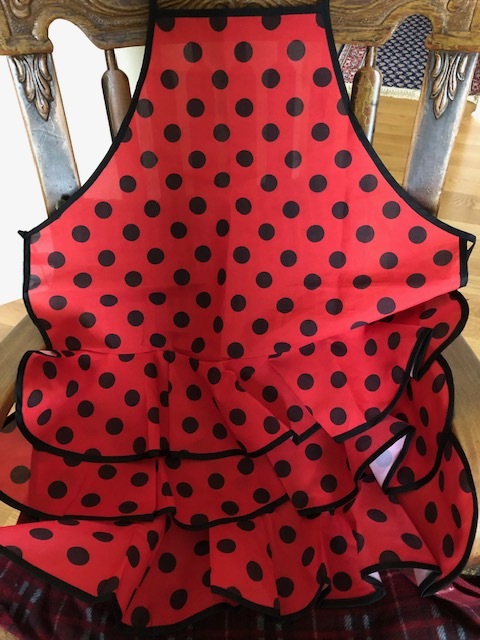 I haven’t yet worn the flamenco dancer apron from Seville. It’s going to take just the right occasion and menu. If you’re a traveler and collect souvenirs as I do from the places you visit, the book, Souvenir, does a great job of giving a larger historical context and will make you consider taking a photo of the Eiffel Tower as your souvenir in place of the Eiffel Tower ashtray or poker chips. In preparing my last blog post I got carried away doing research on the history of the modern calendar and ignored my original plan to describe the calendar I created for 2019. Today I’m returning to that topic. My calendar is not for hanging on the wall nor is it a date book. It’s but a small notebook with blank pages in which I write the date and make a bulleted list of how I spent my time. I don’t include how much time I spent on each activity, just list what I’ve done during the day. It’s not that different from my first grade school diary in which I noted the day’s highlights: went to school; played with Darlene after school; had my piano lesson; Jimmy Butler smile at me today. I started that one with the goal of capturing my secret life. Having none then or now, I just want to get a picture of how I spend my time. The inspiration for this investigation came from questioning why I never seem to have time to explore two projects that interest me. One is sketching. Years ago, when we spent a month each summer in Mexico I sketched and turned my drawings into greeting cards, primitive looking greeting cards, but ones I enjoyed and my friends did too. The other is digging deeper into my family tree. I receive at least one message a day from MyHeritage.com notifying me of someone waiting to hear from me as to whether we share a great-great-great-great-great-great uncle on my father’s side of the family, one who was the third husband of an aunt preceded by the same number of greats and not a blood relative at all. Given the arrival of these announcements, I calculate that a possible 400 relatives are waiting for my response. I don’t feel guilty about not answering. I only want to know who my real relatives were. Without time to research, I can only create fantasies about my Viking ancestors, residents of Normandy, France, who fought alongside William the Conqueror. I do have speculative documents that suggest the latter but no proof they are accurate, and I made up the part about the Vikings on the basis of my Swedish great-grandmother named Mary. Ten days into the year I’ve already learned something important: though I’ve slowed down some I’m not a big time waster, but I eat a lot. My daily writing, exercising, reading and less frequent volunteering take sizable amounts of time, I’m also — with my husband — doing chores, cooking meals, shopping every few days for groceries, paying bills, answering emails, trying to solve one annoying tech problem after another, and feeding the cat (if you saw him you’d know he eats a lot too). I would have much more time to devote to the important stuff if I had 1) a butler 2) a cook 3) a volunteer to take over my volunteering 4) a teenage grandchild who understood technology 5) a personal shopper and 6) a nail technician who made house calls. However, something tells me that if I had all these attendants I still wouldn’t be drawing or digging into family history. I’d be trying to escape from all the extra people running about the house making me wish I were alone. And where would they sleep? The only one worth wishing for is the teenage grandchild. Although I now have a picture of my days, I’m still going to keep track of what I do. My calendar has a limited number of pages so I don’t have to bother with it for long. Over the course of a month or so, I may find some holes in the schedule. And perhaps someday I’ll give up one of my current projects and go back to one waiting for me to return. Happy New Year (on whatever date you celebrate). Here’s hoping your celebration was — or will be — filled with joy, peace and gratitude for waking up to another year. When I began this post, the subject was the calendar I’m creating for 2019. I didn’t intend to write about calendars in general, but as a result of several fascinating pieces I read about the origins of our current calendar, I changed my plan. In the U. S. and most other countries, we’ve adopted the calendar that runs from January through December with alternating 30 and 31 days except in February, but in early Roman civilization — from which ours came — calendars had too many or two few dates. Early Romans used a 355-day calendar. Astronomers working for Julius Cesar modified this in 46 AD and it was used — though not without confusion — for more than 1500 years. The ancients knew that the year was slightly longer than 365 days. By the 1570’s the problem caused by the average year adding up to 365+ days created a calendar that didn’t match the seasons. Pope Gregory commissioned a group to set up a replacement calendar, which involved moving the first day of the year from March 25 to January 1 to better fit the seasons. As someone said, at the rate the days were changing, in time they’d be reaping before they sowed. 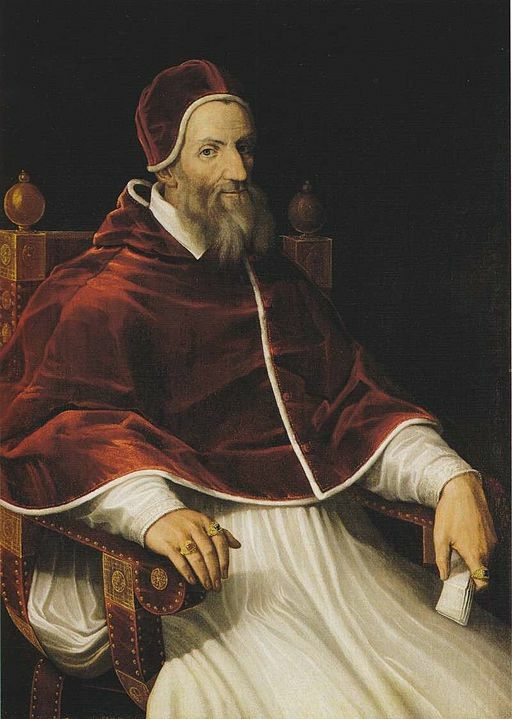 In 1582, the Pope also had to remove 10 days from the calendar — a one-time effort — to make up for all those partial days that added up to one full day every four years. He snatched the days from October. Not all countries responded to the new calendar with enthusiasm. Catholic countries adopted it the same year it was born. The Protestant countries didn’t want a Catholic pope forcing them to change their calendars. And for various reasons related to their own religious calendars, five countries waited until the twentieth century to adopt it. This means that most of the world celebrates New Years on January 1, but not all. In 2019 the Chinese New Year will take place on February 5, in Iran on March 21 and in several southern Indian states on April 6. As soon as I met my writing goal, I began to consider Christmas preparations, which had not been on my things-to-do list for several years. 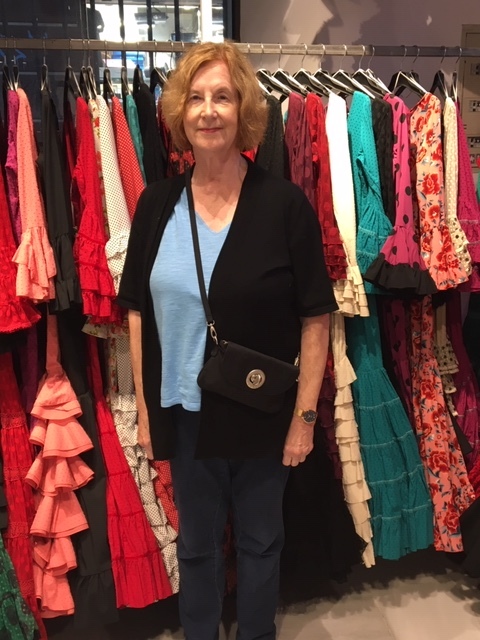 Instead, my husband and I had chosen to escape the chaos of shopping malls, and the temptations of parties serving so much rich food that eventually drove us to the shopping malls to buy larger-sized clothing. 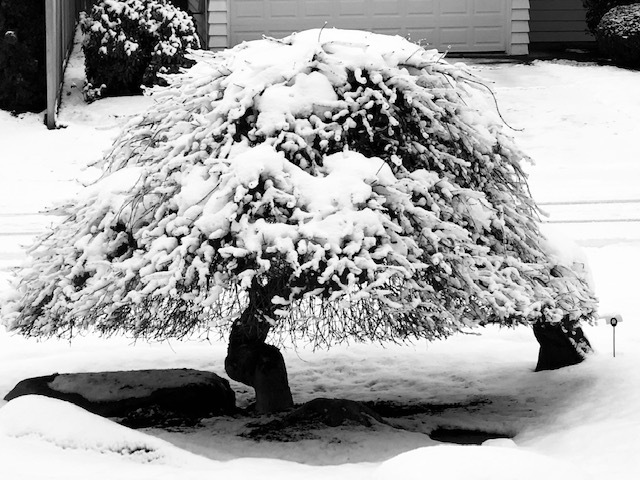 What could be more relaxing, we asked, than a December drive through blinding snow and ice storms, while facing the threat of closed mountain passes to reach quiet, snow-carpeted central Washington and X-country ski for a week? However, now that we’ve gotten back into the holiday mode without family, we’ve rediscovered how much work is involved. Finding a tree with a small enough trunk that didn’t require a forklift to move it and thus avoid buying a Christmas tree stand large enough to hold an elephant’s leg was an early challenge. Then came the letter and card crisis. Normally we write a letter, but I couldn’t think of anything to say this year and wrote one anyway. Then I decided to make a few cards for friends who had sent them to us. Hours and many mistakes later, the thrill of sending handmade cards was waning, especially since they looked just like cards one might get from a young grandchild, perhaps a toddler. Yesterday, we bought cards, a little late in the season, but very presentable. But now we have run out of stamps. Maybe if we get to the post office before it opens, and before people are lugging in boxes the size of a refrigerator and the postal worker tells them they have wrapped them improperly. This year, another challenge involved baking. A pie for this Christmas party, different cakes for others and now one on order for New Year’s. We never had to bake on our ski trips. The gifts were the one easy part. We bought electronics for ourselves and books for everyone else. 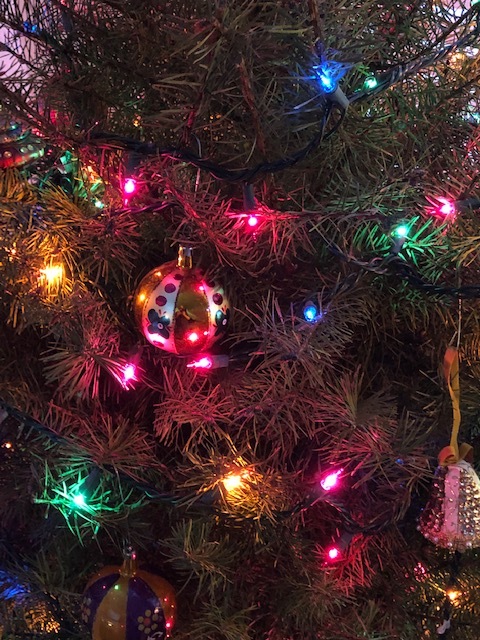 Perhaps next year we should go somewhere warm, some place where they’ve never heard of Christmas, though a friend is blogging from the Middle East and posting photos of Christmas trees from Abu Dhabi. Since returning from Europe I haven’t blogged. 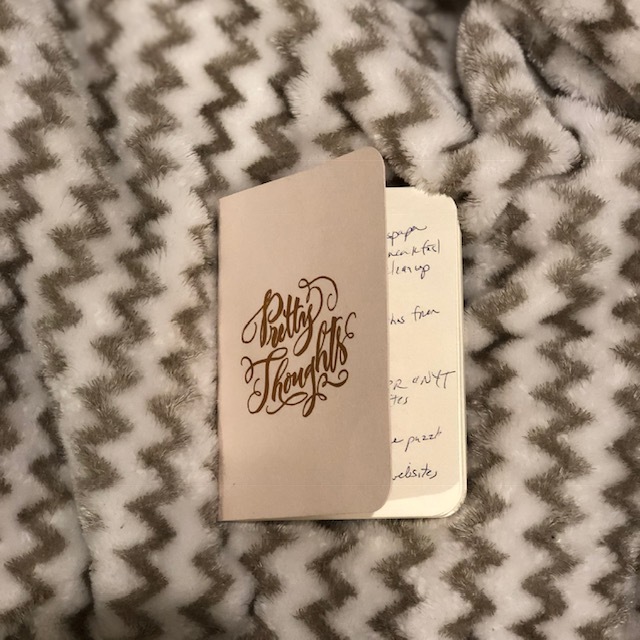 First came jet lag, then the cold and cough, and then all the other activities that make up an ordinary life, but don’t always inspire me to write. Three weeks passed, and friends tired of asking me what was my favorite part of the vacation, probably because my answers were as exciting as a summary of a trip to the dentist. Ultimately, I pieced together different experiences and realized what made our two weeks in Seville special for me, namely, making connections with Spaniards. This means I have a couple more Spain blogs in me. There’s something wonderful about knowing a language that’s not your own, even if you don’t know it perfectly. When you speak the other language you become someone else. What a shock to meet the new me shortly after take-off on the plane from Amsterdam to Seville. They smiled and said yes. One man was Spanish and the other Dutch. The latter spoke fluent Spanish, and the former spoke little English, so there was only one language available to all of us. I’d picked up enough information about guitars, players, and flamenco from forty-six years of marriage to a guitar maker that I could speak comfortably about the subject. The Spaniard played flamenco and classical guitar and sometimes traveled to the U.S. to play at events for his sponsor, Bose. He even gave me his latest CD. 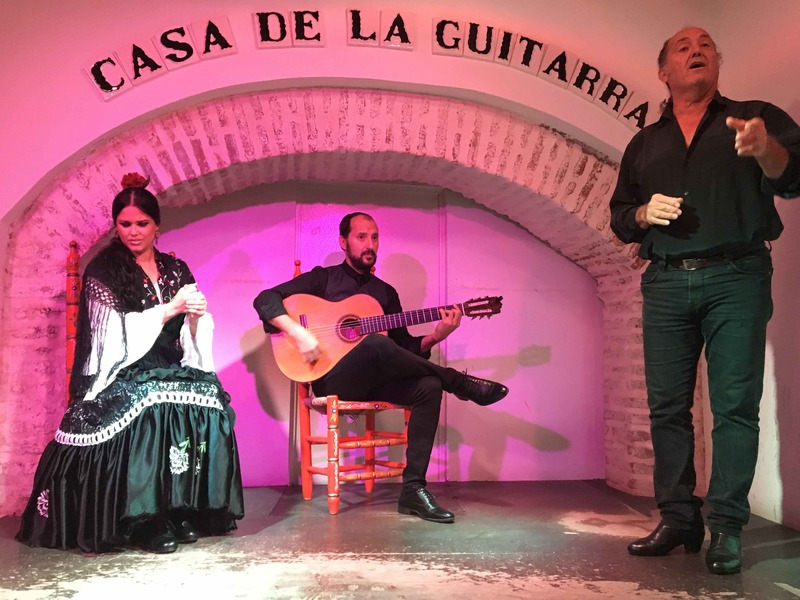 The Dutch musician was going to Seville to play at a memorial. I asked him how much time he devoted to flamenco, expecting him to say he had a day job to support his habit, since Amsterdam isn’t a flamenco hub. Instead, he said that flamenco was his life. Imagine getting something that personal out of someone on an airplane. The old me could never have done it. When I boarded the plane I assessed my Spanish skills as adequate. As we landed I knew I was better prepared than I realized. Both of my seat mates were kind, friendly and willing to engage in a long conversation with someone at least one generation older, if not two. This made for a good introduction to Spain. If they were representative of the rest of the country, we would be fine. And we were. I just checked out a book on flamenco at my library. The old me is back, but the interests that came from my weeks as the new me are here to stay. One day remaining in our two week experiment of living in a Spanish city on our own and I hadn’t found the perfect setting for my annual travel photo. Yes, I must be in the photo, ideally with my hair combed, but more importantly the picture must tell a story about where I am. Last year’s, from our trip to Scandinavia, featured me and a troll, a perfect couple and symbol for that part of the world. I was stuck on how to represent Seville. I didn’t want to pose under a taxidermied bull’s head in a bar, or be dwarfed by a bell tower as tall as a football field is long, or ask a male flamenco dancer with no hips and weighing what I did in high school to pose beside me. What else could I find that typified this beautiful Andalusian city? The answer came to me last night. 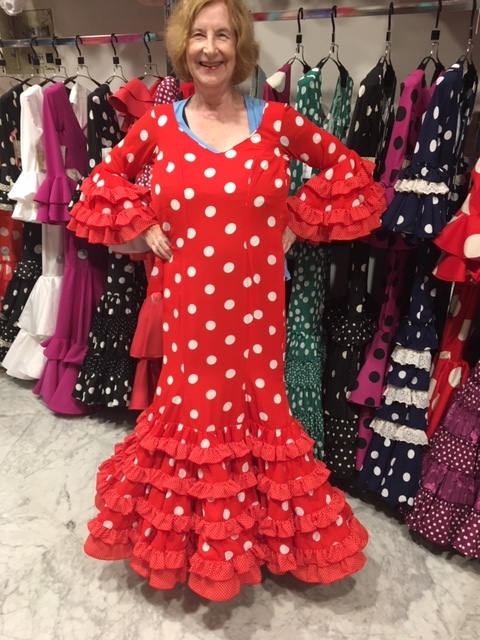 Every street in our neighborhood has at least one small shop dedicated exclusively to flamenco-style dresses, none of which appealed to my middle-class or life-as-a-retiree clothing tastes. 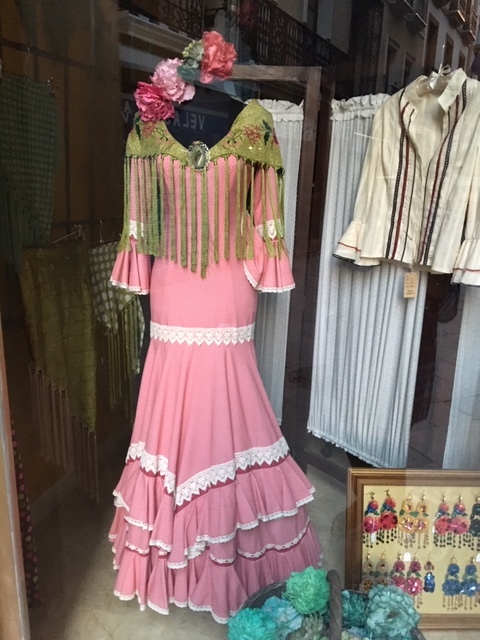 But the dresses were ubiquitous, which made them the perfect symbol for Seville. The next question was how to put myself in a picture with them. “I’ll pose in front of a rack of dresses,” I told my husband, feeling uncomfortable as I walked into one of the hole-in-the wall stores knowing I had no intention of buying a dress, or even looking at one. I hid from the shopkeeper behind a pillar, he took the photo, and we fled. As I looked into the next store, with the shopkeeper sitting at a desk facing the door, I realized that lurking was not getting me anywhere. I walked toward her, glancing at the racks of dresses on both sides of me. 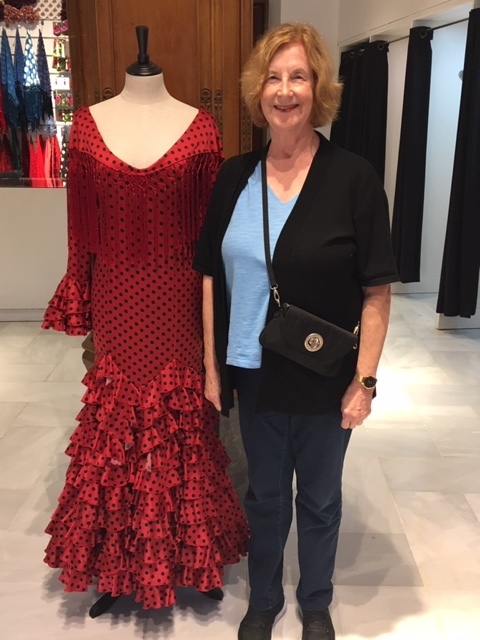 She must have sensed my amazement at the size of her stock because she said, “Una semana, We wear these for only one week a year.” She went on to explain that the occasion is the annual Feria, the Seville Spring Fair, an event that occurs every April. She said that everyone — rich and poor, old and young — dresses up. Maybe not too poor, I thought, as she showed me price tags on the least expensive and most expensive dresses, 250 and 500 Euros, respectively. She works alone now but keeps the store open for Christmas shoppers looking for next year’s dress. Starting in February, the shopping season begins and she hires eight others to help out. I don’t know how the eight could fit in the shop. Where would they put the customers? I asked if she’d mind our taking a picture of me in front of her dresses. “Wait,’ she said as she came out from behind her desk and walked over to one of the racks. “Here. Put your arms through it.” She moved my hands to my waist and signaled to my husband that I was ready for the photo. All of a sudden, the dresses didn’t look so ridiculous. “It’s really heavy,” I said, still wearing a t-shirt, jeans, tennis shoes and my multi-colored polka dot compression socks. I was thrilled to have my photo, but it now seemed less important than having made a connection over an important element of Sevillana culture. “I hope to see you again,” she said. Today’s our last day here, but if there’s time I’ll drop by again and ask what they do during those seven days while wearing their heavy dresses in eighty-degree temperatures.